Today is July 4th! You know what that means, right? 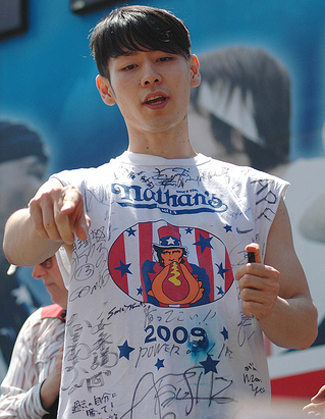 It was time for Nathan’s Famous Fourth of July International Hot Dog Eating Contest in Coney Island in New York. 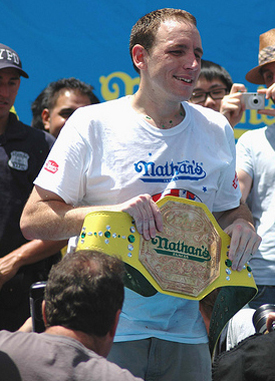 Joey Chestnut of San Jose, CA had to down 68 hot dogs to hold off six-time champion Takeru Kobayashi of Japan. Even though Kobayashi finished with a personal best of 64.5 hot dogs, the day belonged to Joey Chestnut. As you can see in the picture, Takeru Kobayashi wore a shirt that was signed by many of Japan’s Olympic athletes. With six world titles under his belt, Kobayashi has an immense fanbase at this competition. In my opinion, Takeru Kobayashi is the Tiger Woods of hot dog eating competitions. If Kobayashi is there, you know there will be a crowd. He makes me tune in every year without fail. Even when he’s not winning the yellow belt, Kobayashi makes the competition more exciting. God bless him. But alas, 2009 is in the history books. Joey Chestnut is the champion. Maybe next year someone will break the 70-hotdog mark. Goodness. That will be a sight to see.